This beautiful home situated on over six acres of Franklin countryside is an oasis that offers the best of both worlds privacy and the ability to get away from it all while still being within easy access to I-65 and downtown Franklin, Cool Springs and Nashville. Located at 4685 Everal Lane, the five-bedroom, four-and-a-half bath home has an attached three-car garage and a unique stand-alone studio. The approach to the beautiful stone and white exterior says welcome with its covered porch, ample parking and beautiful landscaping. But ites the interior where this home comes alive. From room to room youell be more than impressed with the attention to detail throughout. Uniquely designed fireplace mantles, custom moldings, abundant use of natural light paired with beautiful light fixtures and gleaming hardwood floors all work together to say this is a home of class and comfort. Perfect for entertaining, the rooms easily flow together and most offer direct access to the adjacent exterior living spaces. The formal living room, for example, has a fireplace and comes with plantation shutters. French doors open to the large screened porch that leads to the expansive deck. The large family room is now being used as a music room that easily accommodates a grand piano as well as a comfortable seating area in front of a second fireplace flanked on one side with built-in book shelves and enclosed storage. The formal dining room has ample space for the extended family and is accented by the large bay windows. The kitchen is a chefes dream, with stainless professional-grade appliances that include a double oven with six-eye gas cooktop and a built-in refrigerator with cabinet fronts to match the custom cabinetry. A huge granite-topped work island has a prep sink and provides even more storage. The custom tile backsplash adds a designer touch. Each of the five bedrooms is large, but the master suite is breathtaking. The master bath has everything expected of a home of this stature e’double sinks, marble countertops, a huge soaking tub and amazing closet and vanity space. A private home theater with projection system, tiered flooring and wall sconces will make going out to the movies obsolete. You likely will also give up the gym membership once you see the home exercise space here. The separate studio, however, is one of the propertyes most unique features. With the look of a small country church from the outside, inside youell find a wide open space filled with natural light that has a soaring cathedral ceiling with exposed beams. Its best use is whatever you want it to be. It has electricity and a half bath. This property is zoned for Oak View Elementary School and Page middle and high schools. It is listed at $1,395,000. 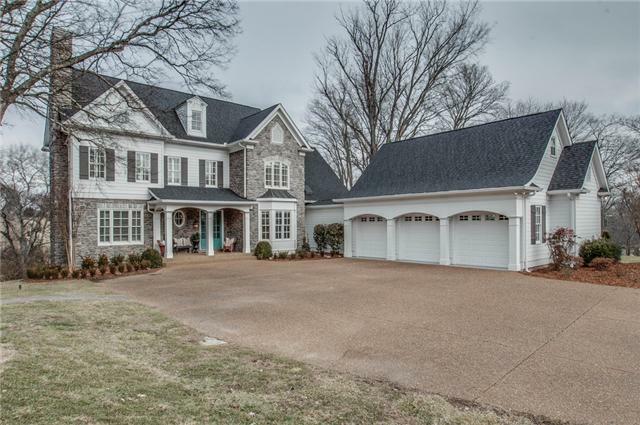 For more information or to arrange a showing, contact Christopher Simonsen of Fridrich & Clark Realty at 615-327-4800.